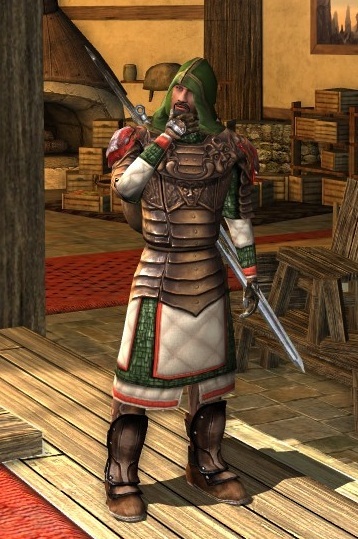 Oh, how happy I was to read that the Rise of Isengard cosmetics included some new and exciting separates. I was thrilled! And several of those pieces are fantastic. 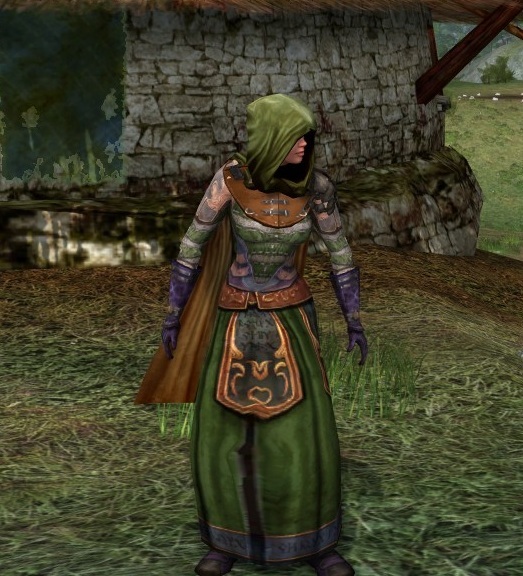 That said…then there’s the Clanweave Robe. Ohh, Clanweave Robe. How wide-hipped you make my female characters look. How disproportionate, how stubby. What an awkward length you are! How annoyed you make me! Hark! That lady over there gets to wear PANTS! I went with an olive-and-violet color scheme to take advantage of the skirt’s hem detail, as well as the brown and violet hues in the chestpiece. Violet shoes help to make the skirt seem a little longer. So what’s YOUR solution? 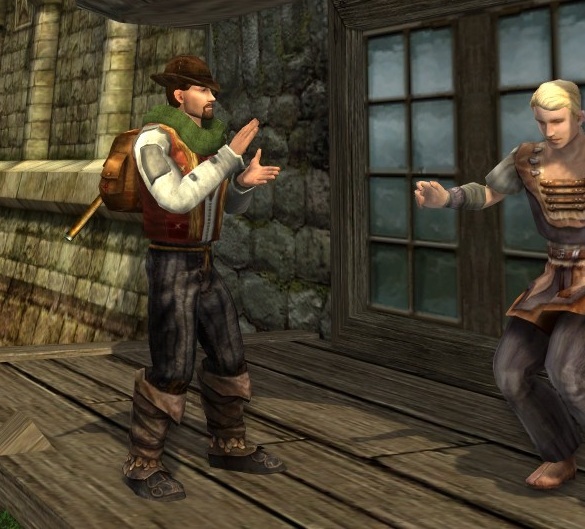 Have you come up with an outfit for the Clanweave Robe (and other items of identical appearance bearing different Dunland names) that pleases you? Share! And I’m back! Well, for certain definitions of “back.” For me, “back” means “sitting in corporate housing with my new husband and three cats while frantically searching for long-term housing that will take three cats.” But! The important thing is, I have my PC back. Thanks for the good wishes by comment, Skype, and email, by the way! Three days in, we still like each other. One look through the round window of his sitting-room confirmed it: today would be a lovely sort of day. 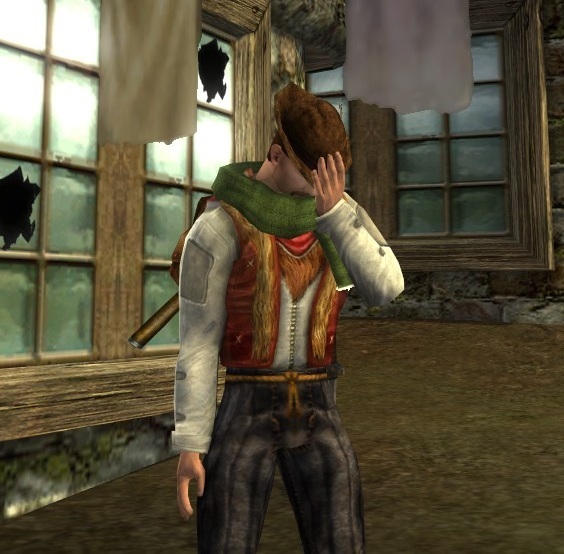 Toradoc Broadbrook set his father’s cap on his head just so. It was a splendid thing with gold embroidery and not one, but two feathers, like those worn by the finest sort of Hobbits. 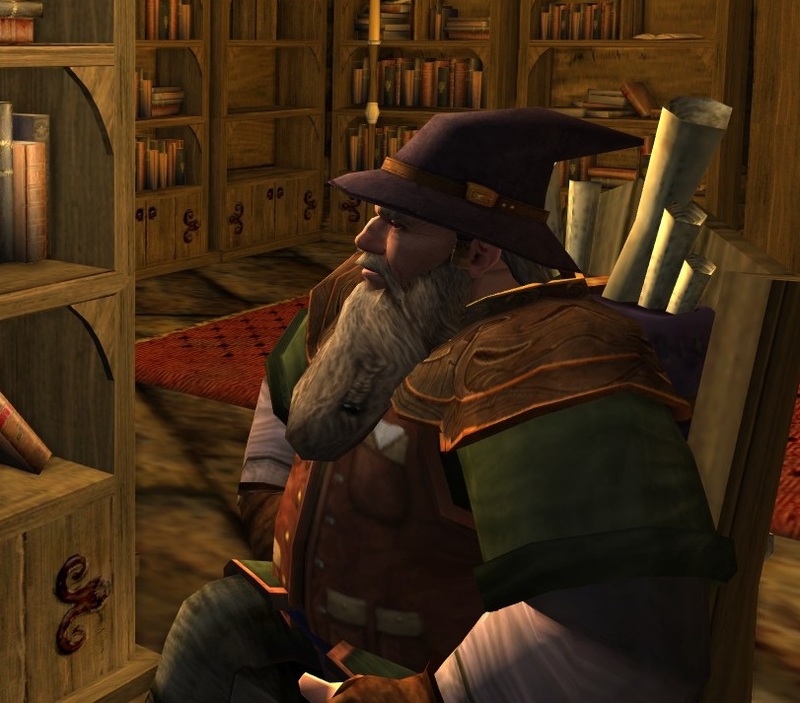 His snowy white cloak was a gift from his wife Maisie’s mother, and though it was a bit fanciful for a good Hobbiton fellow – even a wealthy one – it kept the chill off and gave Toradoc a certain sort of dash. “Father!” Little Bobbin ran up and held his chubby arms up to his da. “Ma wants flowers on the tea-table!” Toradoc swooped his son up onto his shoulders, calling, “Duck!” as they passed through the freshly-painted door and out into a brisk, sweet-smelling sunrise. Bobbin giggled and held tight. There’s just about nothing prettier than sunrise over Hobbiton. 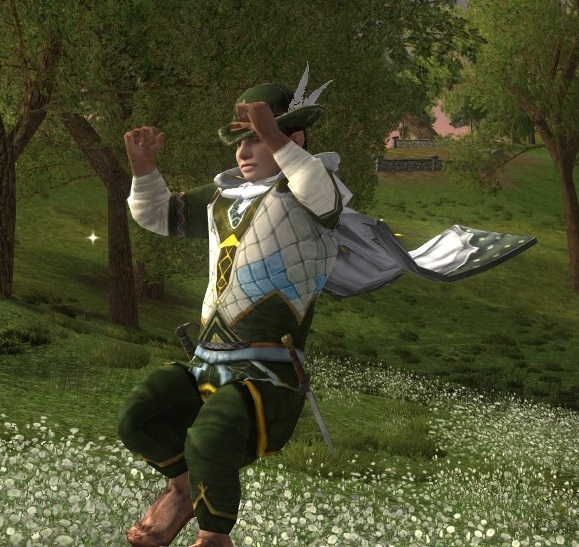 Here’s how we play jump-the-flower-patch, my boy! 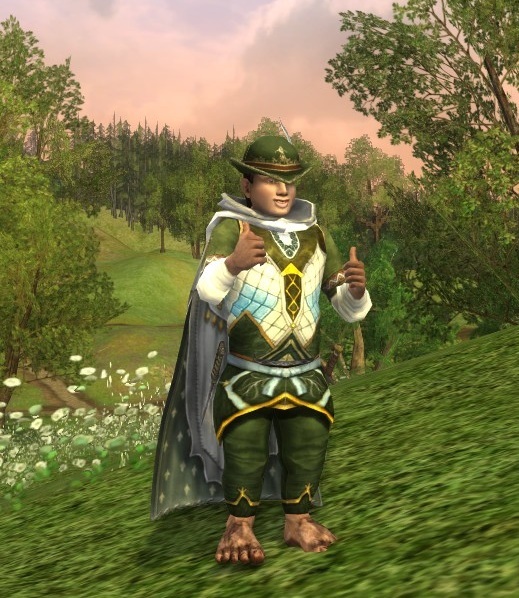 Who has two thumbs and looks awesome in olive, pale blue, gold, and white? THIS GUY. 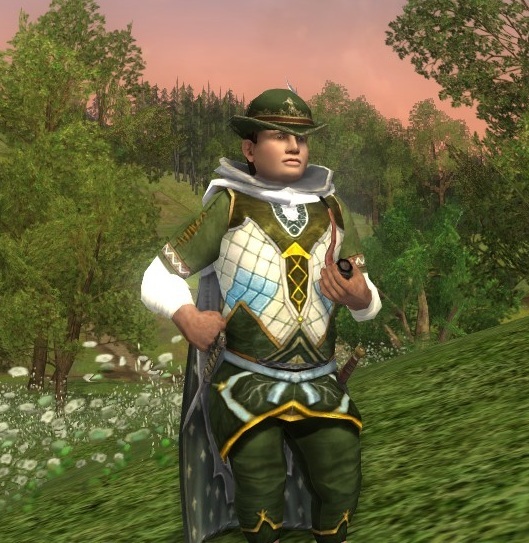 I’m a big fan of the Yule festival outfit sets, even though they bring top hats into a world where I, completely uneducated costume commentator, would find it odd to see a top hat. (“I say, Frodo. 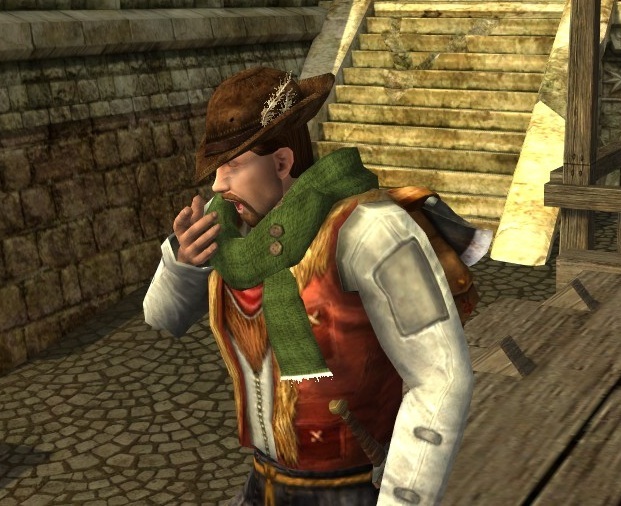 Pass the monocle so I can get a better look at this ring business.”) I’m certainly fond of scarves and Yule cloaks. I’ve waxed poetic about the lovely Frostbluff Robe/Dress of Thanks. That said, my favorite pieces are actually the “Shabby” items. 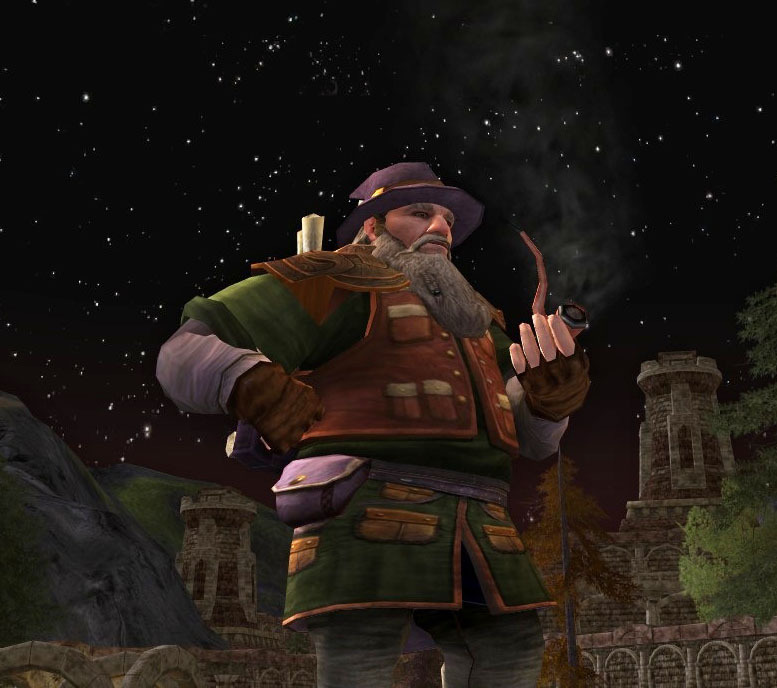 As a roleplayer, I don’t always want to portray someone notable or wealthy or highborn. I have the greatest respect for the Professor’s source material, and one of my takeaway messages from the Lord of the Rings is that the small and humble can achieve great ends. So some days, this character heads off to the woods for a bit of chopping, trapping, hunting…whatever might bring a few coppers into his pocket. Evenings, he meets up with mates for a pint; at night, he dreams of softer beds and warmer clothes. Our man finds simple pleasures where he can. He works hard for the money. 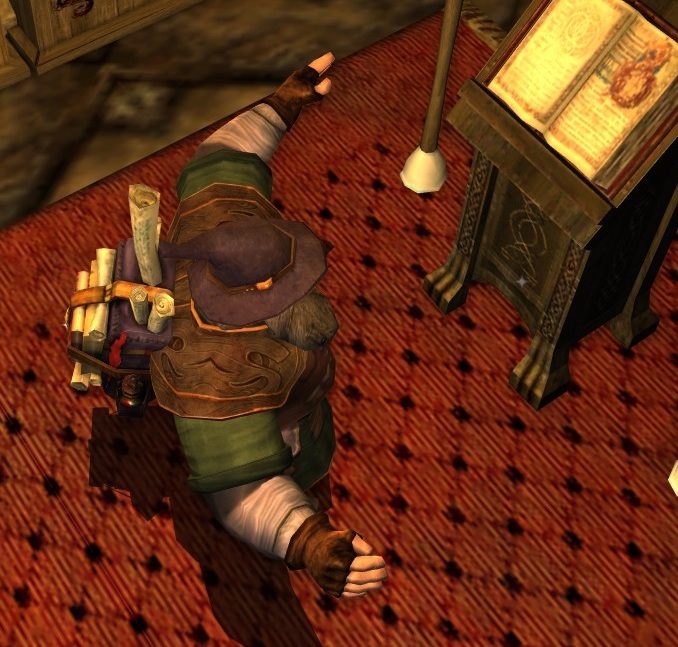 Hands: Like many tunics and sets, the chest item somehow overrides all hand items. 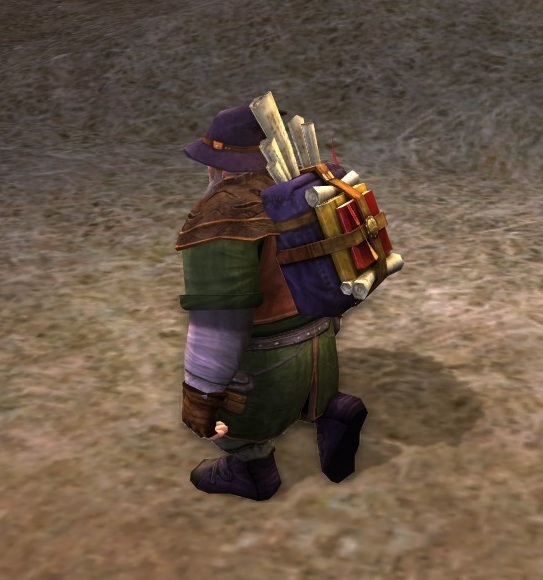 Otherwise, he would have worn the Fingerless Gloves, also from the “Shabby” Yule quest reward set. Ruthanar is an enigma wrapped in a mystery, wrapped in a burrito (I can make fun of him, he’s mine!). 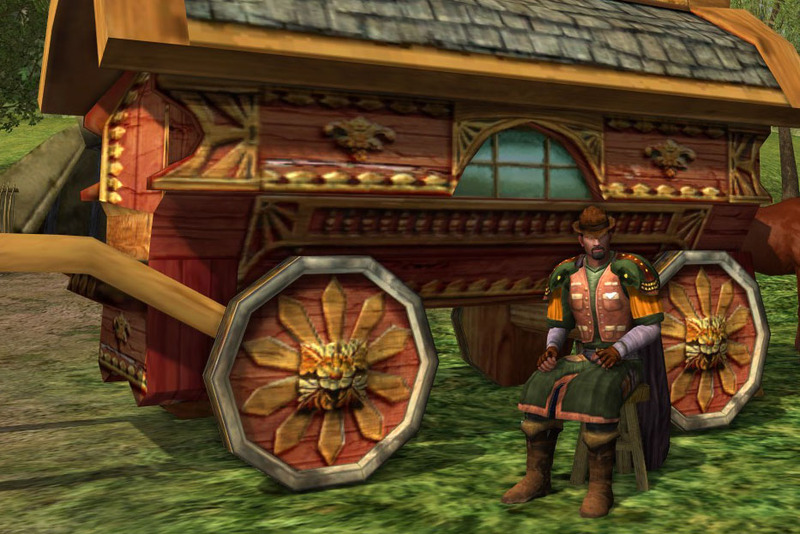 A warrior of the lands south and east of Eriador, he physically has the look of some of the shadowy men called Rangers, but he seems to hew to no particular band or code. His armor has the look of a kit gained over time, a little bit here, a little bit there. 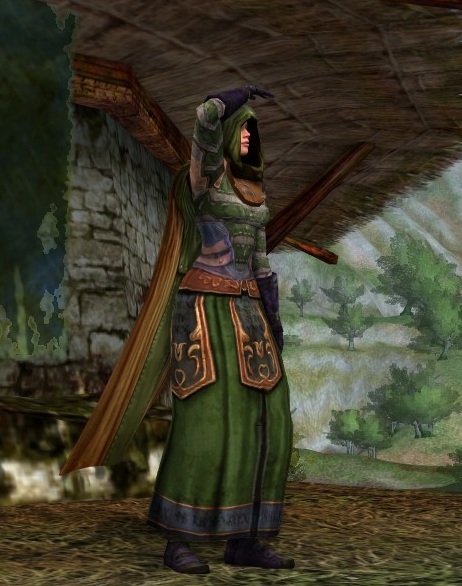 Ruthanar is dressed primarily in items bought from the LOTRO Store (What, you use your TP for stat tomes and slayer deed accelerators? Huh.) and dyed olive, with additional pieces dyed red and umber. 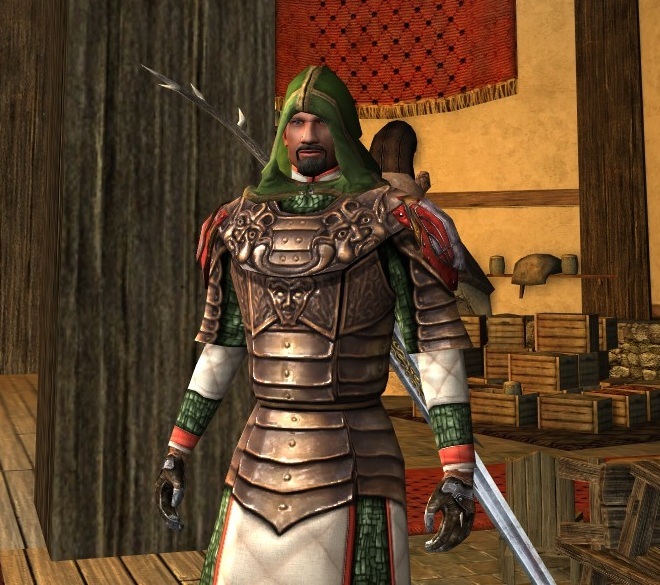 Mad props to my fantastic friend Amimain, on whose (since re-rolled) character Jonathen I first saw the Hauberk of Rhûn/Traveler’s Hood combination. What corner should I lurk in next? /em glowers from within the shadows of his hood. /em stares at you with eyes that pierce your soul. Like a toothpick. 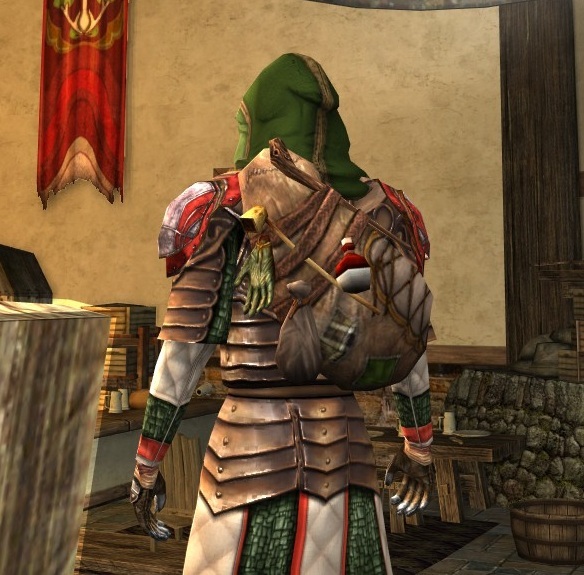 Even I, mysterious warrior, have no idea why there is a single green glove fluttering from the back of my otherwise super-awesome pack. If I bounce up and down really quickly, it looks like it’s waving.